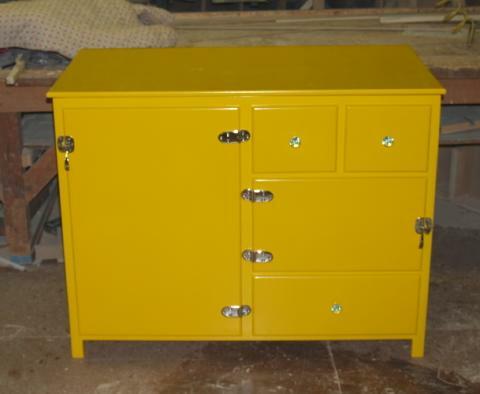 Occasionally, we get a custom request to alter one of our designs to accommodate a particular need. We’ve also built a few custom pieces that are completely different than any of our pre-designed pieces. Below are just a few of these custom and semi-custom workstations. 1. Curio display cabinet. 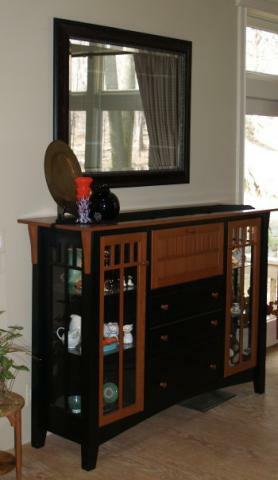 This painted black and stained cherry craftsman style piece even has a fold-down countertop. 2. Custom B72 The customer did not feel that hiding the oven was as important as creating a balanced unfitted furniture piece that could have downdraft ventilation a cooktop and an oven all in one piece. 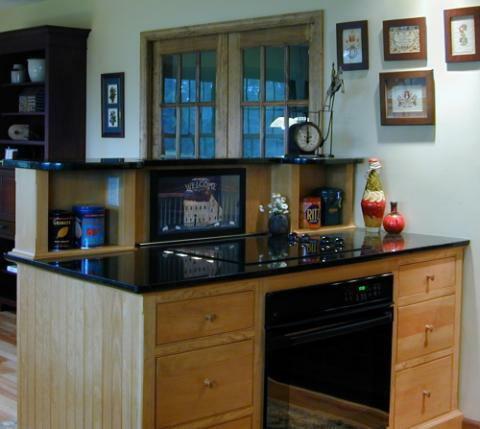 Typically it is not possible to incorporate all three appliances and hide the oven as well. 3. 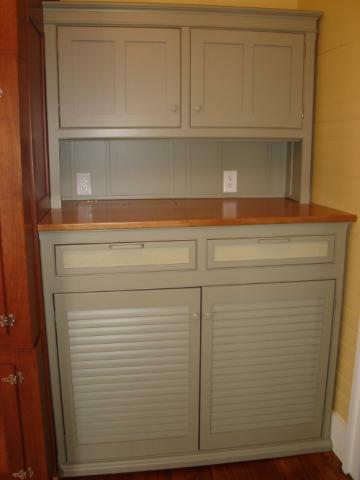 Custom Washer / Dryer Cupboard This painted piece completely conceals a standard washer and separate dryer in a primitive piece. 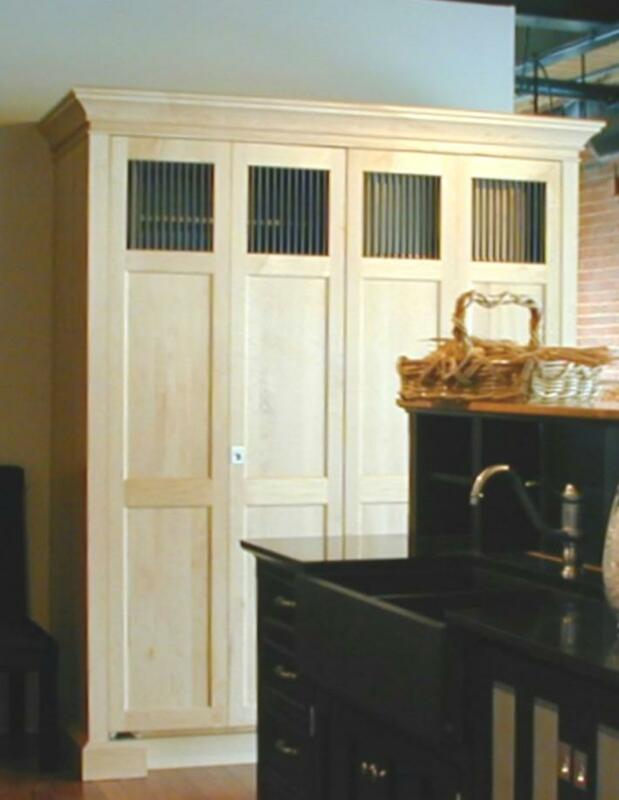 The louvered doors allow for proper ventilation while the units are operating and a special trap door allows access to the water supply valves. 4. 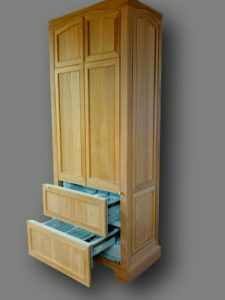 Custom unfitted AR68 Laundry Armoire This natural maple piece conceals an entire laundry center behind full height pocket doors. 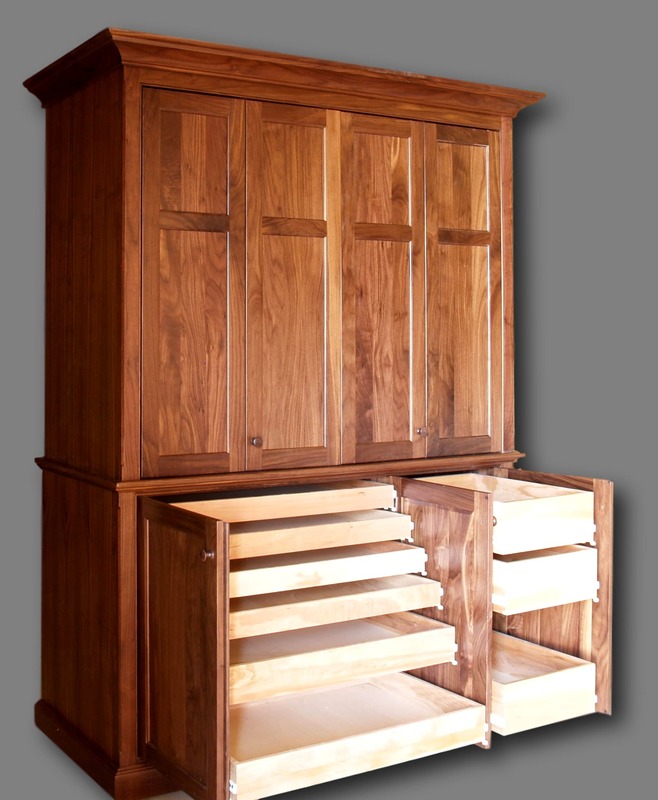 Storage doors and doors conceal a hamper and pull-out ironing board too. 5. 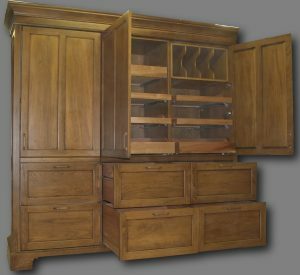 Butler’s Kitchen / Pantry This piece is very similar to our UK68B in function, however it was built to be installed in the existing pantry closet of a period style home. 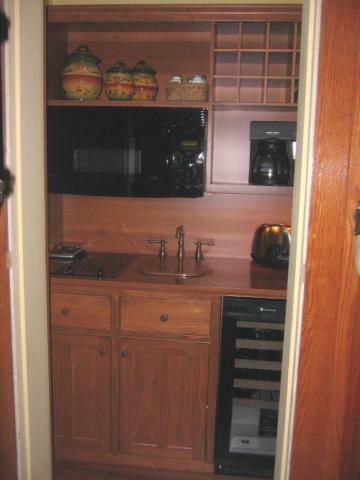 It features a wine cooler, sink, 2 burner ceramic cooktop and an Advantium oven. 6. 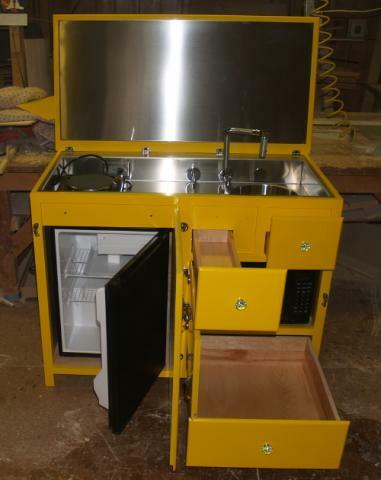 Custom Ice Box Style Mini-kitchen Shown in our factory, this freestanding piece includes a fold-down top that conceals the stainless steel sink, countertop, movable cooktop. Notice Kohler’s very cool folding faucet! Below, a small refrigerater and microwave are concealed as well. 7. 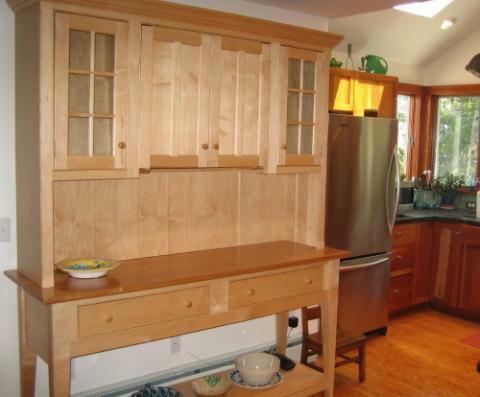 WT 22 x 66 Work Table with Custom Cupboard above Here, a standard natural maple work table combines with a cupboard that conceals a small plugged in microwave behind pocket doors. The microwave is actually much deeper than the cupboard, so the wall behind is recessed to receive it. 8. 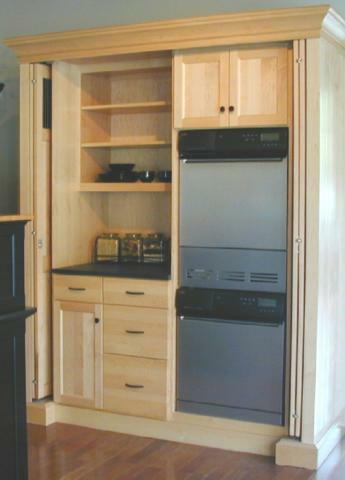 This altered SZ pine pantry includes a full height Subzero refrigerator freezer on the left and a pantry in the center and right sections. 9. This is a completely custom Subzero unit (shown prior to shipping) made of Cypress and sent to the customer unfinished so that it could be stained and finished to match an existing kitchen with built-in cabinetry. Its cornice was too tall to be mounted in our factory. 10. This is an altered working pantry made of Walnut that is completely filled with roll-out trays to accommodate specific sizes of media for an artist’s studio.